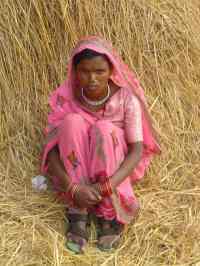 Sahida is a slightly built woman of about 30yrs of age, she guessed her age as she is not very sure when she was born. She speaks very quietly often covering her mouth and face with the shawl part of of her sari, she lowers her head when she describes the difficulties she has faced in her life so far. Sahida is one of six children, she has one older brother, two younger brothers and two younger sisters. Her parents both still live in Adiyanpur the village of her birth. The big question as for many young Nepali girls is will their parents be able to make a good match for them. Its not a matter of should they marry, but can their parents afford the dowry and find a good man (or young boy) from a respectable family, preferably one with land and work. Sahida’s parents found her a young man and she married at the tender age of 15. That sounds very young to us but quite common in Nepal although these days early marriage is discouraged. It was a few months before her marriage that she noticed the pale patches on her skin and experienced tingling sensations in her hands and feet. As she knew nothing about Leprosy she paid no attention to the patches believing them to be a simple problem that would disappear in time. Though they did not vanish for a couple of years they caused her no concern. The first two years of her marriage were okay, but slowly her life began to change, she began to get wounds on her feet and became very worried as she felt no pain. She went to Lalgadh Hospital for tests and it was confirmed she had Leprosy. She was so afraid of what her husband would do if he found out that she went and stayed with her parents. This was with the hope that the wounds would heal and he need never know of her disease. Sahida’s parents were sympathetic, but one of her brothers was very wary of coming near or touching her. Soon some of the neighbours found out and word spread to her husband. He reacted as many do he left her and took another wife. Sahida was distraught and fearful for her future. Why had this happened, what had she done wrong?!! There are many erroneous beliefs about the cause of Leprosy. Some believe it is caused by the sin in a person’s life, others by a certain food the list goes on and varies from place to place and between different religions. It is actually caused by a bacteria and is curable by the patient taking a course of multi-drug therapy. Sahida’s family were also afraid of what the consequences would be if more people and family members learnt of Sahida’s disease. It is often difficult to arrange marriages or get work if a family member has Leprosy. Sahida’s sister in law did not know when she married Sahida’s brother that Sahida had leprosy. She was very upset and angry when she found out and has hated Sahida ever since. She felt deceived as she was not told before the wedding. She does not believe leprosy is curable and is afraid of catching the disease. For ten long years Sahida endured neglect in her family home, often given poor food and most of the work to do. Worst than this were the constant arguments and verbal abuse she had to put up with. Sahida decided to go and ask her husband to take her back into his home, even though she did not know how he would treat her. Staff at Lalgadh Self Care Centre counselled Sahida about the possible difficulties of such a move. She was determined. So her husband was called to Lalgadh and Sahida’s request was explained to him. After much discussion he reluctantly agreed, he collected her from her parent’s house and took her to his home, where he lived with his new wife. Sadly any hopes of an improved lifestyle were quickly dashed when it became clear that she was just as a servant in his home. She was given a small corner of the house with just enough room to lie down. Sahida’s husband showed her no love and affection; she was beaten from time to time and took verbal abuse from the neighbours and relatives. No one would come close enough to touch her. Sahida’s days were long and arduous, starting with housework at 5am, followed by faring in the field from 8 until 5 or 6pm. Housework consisted of cleaning, washing clothes by hand, fetching water and cooking. Sahida had learnt about her Self Care needs while a trainee in Lalgadh Self Care Training Centre. (All Leprosy Affected people who come to Lalgadh for treatment are encouraged to complete the two week residential Self Care course. This has helped considerably in prevention of deformities and greatly increased patients knowledge of the disease.) After the work was done she would do her self care, soaking and oiling her hands and feet, and doing exercises to prevent deformities. She slept from about 11pm each night. Sahida comes as regularly as her family will allow, to the STEP Self Help group at Loharpotti. They support her and listen to her problems. They understand because many have had similar problems, and still do. Her husband and his family don’t like her going to the group as while there she is not working. While her husband is away in India life is not too bad . Sahida said the family seem to listen to her but they only listen with one ear and then don’t remember anything she has said. Her husband is afraid she wants his child. He has said that even if they put him in jail he would never give her a child, or keep her as his wife. All Sahida wants is to be treated with respect, for her husband to talk to her as he would any other human being. She feels the village dogs get better treatment than she does. Sahida still dreams of one day having her own small house with her own land and her own income. She dreams of being in control of her life. One small step towards that could be the training she will get at Lalgadh, training in painting, sewing and embroidery. She is good with her hands and quite artistic, so the hope is to enhance those skills so she can produce goods that can be sold and give her an income of her own. This is also the first step towards the vision staff of Lalgadh’s Community Development Department have for a training centre where people can learn skills to give them the gift of an independent income. Please remember Sahida in your prayers and those who support her and try to help her towards independence.